Mark Smith was born in 1946 in Lima, Ohio. He enlisted in the U.S. Army on February 10, 1964, and after completing basic training at Fort Ord, California, and Wheeled Vehicle Maintenance training, he was assigned to the 85th Ordnance Battalion in West Germany from May 1964 to August 1965, during which time he completed jump school in Germany. Sgt Smith returned to the U.S. in August 1965, and participated in the Occupation of the Dominican Republic before deploying to Southeast Asia with 2nd Battalion, 28th Infantry Regiment of the 1st Infantry Division in December 1965. After being wounded, he was hospitalized in Japan for several months, and then returned to South Vietnam where he served with 2nd Battalion of the 28th Infantry Regiment from June 1966 until returning to the U.S. in May 1968. 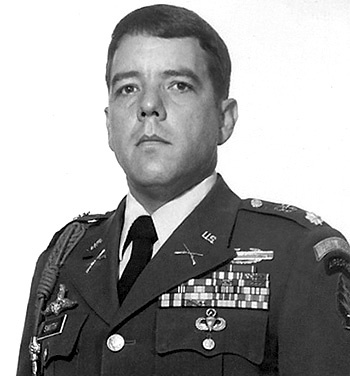 On February 22, 1968, SSG Smith was given a battlefield commission to 2nd Lt. Lt Smith then attended the Infantry Officer Basic Course at Fort Benning, Georgia, from May to July 1968, followed by service as an instructor with the U.S. Army Infantry School at Fort Benning from August to October 1968. He attended the Military Assistance Training Advisors course with the U.S. Army Special Warfare School at Fort Bragg, North Carolina, from October to November 1968, and then completed Vietnamese language training at Fort Bliss, Texas, from December 1968 to January 1969. His next assignment was as an advisor with U.S. Military Assistance Command Vietnam from February to December 1969, followed by service as commander of a counterinsurgency unit with the 506th Infantry Regiment of the 101st Airborne Division from December 1969 to September 1970. Capt Smith served as an instructor in the Ranger Department at Fort Benning from October 1970 to September 1971, and then returned to South Vietnam where he served as an advisor with Military Assistance Command Vietnam from November 1971 until he was captured and taken as a Prisoner of War during the Battle of Loc Ninh on April 7, 1972. After spending 312 days in captivity in Cambodia, Capt Smith was released during Operation Homecoming on February 12, 1973. He was briefly hospitalized to recover from his injuries, and then served as Battalion S-3 (Air) for 1st Battalion, 38th Infantry Regiment of the 2nd Infantry Division in South Korea from September 1973 to October 1974, followed by service as a Refugee Coordinator at Fort MacArthur, California, from November 1974 to July 1975. After completing Pathfinder School and the Infantry Officer Advanced Course at Fort Benning, Capt Smith served as Executive Officer and then Company Commander of Company B, 1st Battalion of the 7th Special Forces Group at Fort Bragg from August 1976 to July 1978. His next assignment was as a Psychological Operations Officer with the 7th Special Forces Group from July 1978 to March 1979, followed by service as a Training Officer and Reserve Special Forces Evaluator with Headquarters 6th Army at the Presidio of San Francisco, California, from May 1979 to July 1981. Maj Smith's final assignment was as Commander of the U.S. Army Special Forces Detachment in South Korea from July 1981 until his retirement from the Army on June 1, 1985. Mark Smith has lived in Thailand since his retirement from the Army, and has remained active in POW/MIA Issues in Southeast Asia. For extraordinary heroism in connection with military operations involving conflict with an armed hostile force while serving as the Senior Battalion Liaison Officer to the 9th Infantry Regiment, 5th Infantry Division, Army of the Republic of Vietnam, during the period 5 April 1972 to 7 April 1972. On 5 April 1972, North Vietnamese and Viet Cong forces launched a major offensive with the objective of capturing Binh Long Province in Military Region Three. The 5th Viet Cong Division was targeted against Loc Ninh, the capital of Loc Ninh District in northern Binh Long Province. The 5th Viet Cong Division launched a massive coordinated ground attack against Loc Ninh beginning early in the morning of 5 April 1972. The attack was supported by artillery and tanks. Captain Smith skillfully directed tactical airstrikes and helicopter gunships in support of the 9th Infantry Regiment and other South Vietnamese forces in the area. To inflict the maximum casualties on the enemy and to bring the fires as close as possible to the friendly forces, he left the safety of his bunker and moved throughout the area seeking strategic vantage points from which he directed friendly fire. Time and time again he directed the fighters, bombers, gunships, and artillery fire on top of his own position to drive off the attacking enemy. The combination of Captain Smith's courage and professional skills coupled with all available firepower kept the numerically superior enemy at bay for more than two days. Captain Smith's extraordinary heroism was in keeping with the highest traditions of the United States Army and reflected great credit upon himself and the military service.